PHimani introduces for the first time an ayurvedic cough syrup with chyawanprash, Himani Sardi Ja Cough Syrup. Chyawan concentrate helps in building immunity and provides energy. Its double action remedy provides relief from cough, cold, throat irritation and restores health. Its rich-thick formula coats your throat for a long lasting relief. 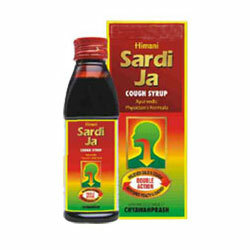 Sardi Ja cough syrup can be taken any time of the day as it does not cause drowsiness. Cough and cold brings down the body immunity level and drains out body energy. Other cough syrup do not recharge your energy whereas Himani Sardi Ja Cough Syrup restores health and energy. Soothes the inflamed respiratory tract caused by throat and bronchial irritation. Helps in overcoming lethargy, builds immunity and makes you feel totally fit. Helps clear blocked nose and sinuses and thus restore proper breathing. Nasal Decongestion Expectoration, Suppressing Cough, Sore Throat, Cough & Cold, Allergic Cough, Smoker's cough, Building Immunity, Restoring energy. Sardi Ja can be taken anytime of the day as it does not cause drowsiness. Adult: 1-2 teaspoonfuls thrice a day. Children:1/2 - 1 teaspoonful thrice a day.